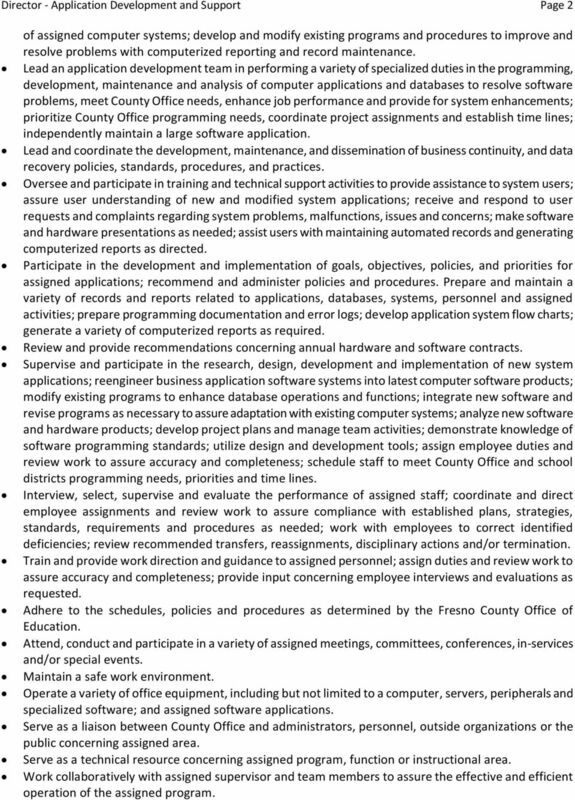 Download "FRESNO COUNTY OFFICE OF EDUCATION CLASSIFIED MANAGEMENT POSITION Effective: October 1, 2015"
2 Director - Application Development and Support Page 2 of assigned computer systems; develop and modify existing programs and procedures to improve and resolve problems with computerized reporting and record maintenance. Lead an application development team in performing a variety of specialized duties in the programming, development, maintenance and analysis of computer applications and databases to resolve software problems, meet County Office needs, enhance job performance and provide for system enhancements; prioritize County Office programming needs, coordinate project assignments and establish time lines; independently maintain a large software application. Lead and coordinate the development, maintenance, and dissemination of business continuity, and data recovery policies, standards, procedures, and practices. Oversee and participate in training and technical support activities to provide assistance to system users; assure user understanding of new and modified system applications; receive and respond to user requests and complaints regarding system problems, malfunctions, issues and concerns; make software and hardware presentations as needed; assist users with maintaining automated records and generating computerized reports as directed. Participate in the development and implementation of goals, objectives, policies, and priorities for assigned applications; recommend and administer policies and procedures. Prepare and maintain a variety of records and reports related to applications, databases, systems, personnel and assigned activities; prepare programming documentation and error logs; develop application system flow charts; generate a variety of computerized reports as required. Review and provide recommendations concerning annual hardware and software contracts. Supervise and participate in the research, design, development and implementation of new system applications; reengineer business application software systems into latest computer software products; modify existing programs to enhance database operations and functions; integrate new software and revise programs as necessary to assure adaptation with existing computer systems; analyze new software and hardware products; develop project plans and manage team activities; demonstrate knowledge of software programming standards; utilize design and development tools; assign employee duties and review work to assure accuracy and completeness; schedule staff to meet County Office and school districts programming needs, priorities and time lines. Interview, select, supervise and evaluate the performance of assigned staff; coordinate and direct employee assignments and review work to assure compliance with established plans, strategies, standards, requirements and procedures as needed; work with employees to correct identified deficiencies; review recommended transfers, reassignments, disciplinary actions and/or termination. Train and provide work direction and guidance to assigned personnel; assign duties and review work to assure accuracy and completeness; provide input concerning employee interviews and evaluations as requested. Adhere to the schedules, policies and procedures as determined by the Fresno County Office of Education. Attend, conduct and participate in a variety of assigned meetings, committees, conferences, in-services and/or special events. Maintain a safe work environment. Operate a variety of office equipment, including but not limited to a computer, servers, peripherals and specialized software; and assigned software applications. Serve as a liaison between County Office and administrators, personnel, outside organizations or the public concerning assigned area. Serve as a technical resource concerning assigned program, function or instructional area. Work collaboratively with assigned supervisor and team members to assure the effective and efficient operation of the assigned program. 3 Director - Application Development and Support Page 3 OTHER DUTIES: Drive a vehicle to conduct work using own transportation. Perform related duties as assigned. KNOWLEDGE AND ABILITIES: KNOWLEDGE OF: Computer programming systems, applications and languages utilized by the County Office. 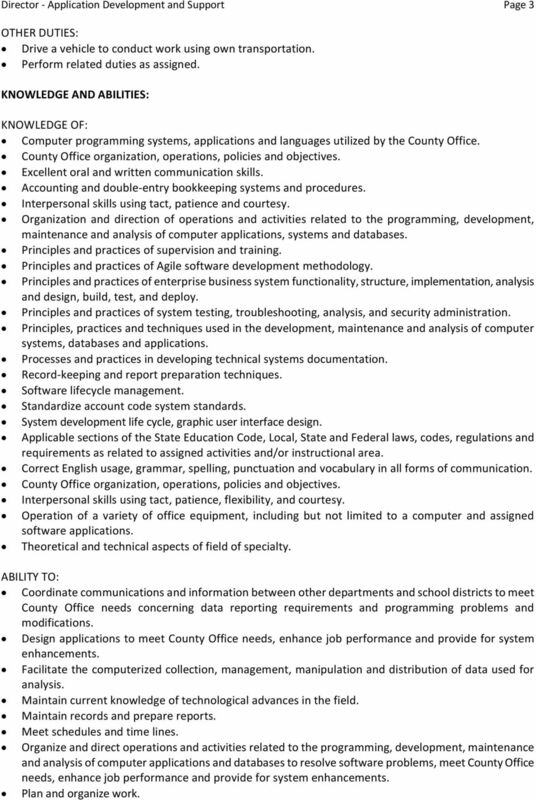 County Office organization, operations, policies and objectives. Excellent oral and written communication skills. Accounting and double-entry bookkeeping systems and procedures. Interpersonal skills using tact, patience and courtesy. Organization and direction of operations and activities related to the programming, development, maintenance and analysis of computer applications, systems and databases. Principles and practices of supervision and training. Principles and practices of Agile software development methodology. Principles and practices of enterprise business system functionality, structure, implementation, analysis and design, build, test, and deploy. Principles and practices of system testing, troubleshooting, analysis, and security administration. Principles, practices and techniques used in the development, maintenance and analysis of computer systems, databases and applications. Processes and practices in developing technical systems documentation. Record-keeping and report preparation techniques. Software lifecycle management. Standardize account code system standards. System development life cycle, graphic user interface design. Applicable sections of the State Education Code, Local, State and Federal laws, codes, regulations and requirements as related to assigned activities and/or instructional area. Correct English usage, grammar, spelling, punctuation and vocabulary in all forms of communication. County Office organization, operations, policies and objectives. Interpersonal skills using tact, patience, flexibility, and courtesy. Operation of a variety of office equipment, including but not limited to a computer and assigned software applications. Theoretical and technical aspects of field of specialty. ABILITY TO: Coordinate communications and information between other departments and school districts to meet County Office needs concerning data reporting requirements and programming problems and modifications. Design applications to meet County Office needs, enhance job performance and provide for system enhancements. Facilitate the computerized collection, management, manipulation and distribution of data used for analysis. Maintain current knowledge of technological advances in the field. Maintain records and prepare reports. Meet schedules and time lines. Organize and direct operations and activities related to the programming, development, maintenance and analysis of computer applications and databases to resolve software problems, meet County Office needs, enhance job performance and provide for system enhancements. Plan and organize work. 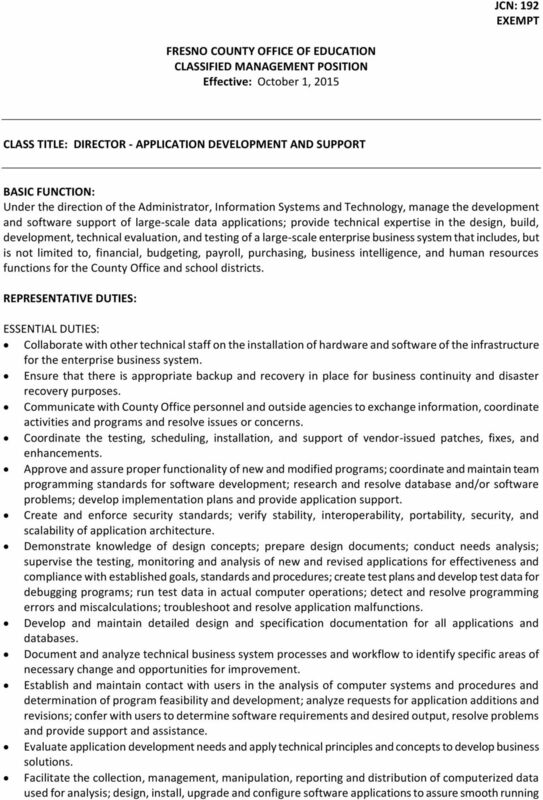 4 Director - Application Development and Support Page 4 Prioritize County Office programming needs, coordinate project assignments and establish time lines. Supervise and participate in the research, design, development and implementation of new system applications as appropriate. Train and evaluate the performance of assigned personnel. Troubleshoot and resolve application malfunctions. Analyze and evaluate situations accurately and adopt an effective course of action. Assure proper and timely resolution of issues, concerns and conflicts. Communicate effectively both orally and in writing. Drive a vehicle to conduct work. Establish and maintain cooperative and effective working relationships with others contacted in the course of work. Interpret, apply, and explain rules, regulations, policies and procedures. Maintain consistent, punctual and regular attendance. Operate a variety of office equipment and peripheral equipment, including but not limited to a computer and assigned software applications. Serve as a liaison between County Office administrators and personnel, outside organizations or the public concerning assigned program. Supervise, train, guide and evaluate the performance of assigned personnel. Use professionally appropriate interpersonal skills including but not limited to tact, patience, flexibility and courtesy. Work confidentially and with discretion. Work independently with little direction. EDUCATION: Bachelor s degree. Master s degree preferred. EXPERIENCE: Five years increasingly responsible experience using SQL, Object oriented languages such as Java, Visual Basic, VB.Net, ASP.Net, C#, and C++; proficiency in the analysis, programming and design of computer systems and applications. LICENSES AND OTHER REQUIREMENTS: Valid California driver s license; while employed by the Fresno County Office of Education, incumbent must be insurable at the standard rate by the employer s insurance carrier at all times. 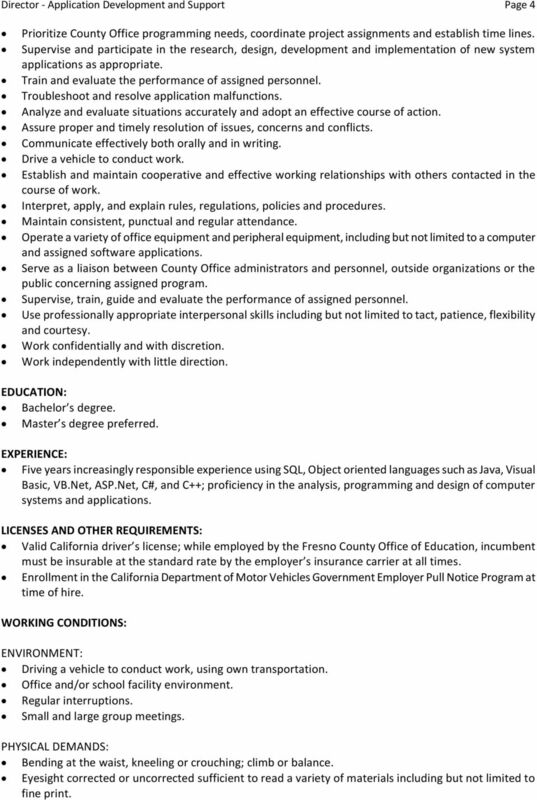 Enrollment in the California Department of Motor Vehicles Government Employer Pull Notice Program at time of hire. WORKING CONDITIONS: ENVIRONMENT: Driving a vehicle to conduct work, using own transportation. Office and/or school facility environment. Regular interruptions. Small and large group meetings. PHYSICAL DEMANDS: Bending at the waist, kneeling or crouching; climb or balance. Eyesight corrected or uncorrected sufficient to read a variety of materials including but not limited to fine print. 5 Director - Application Development and Support Page 5 Hearing with or without use of hearing aid(s) sufficient to hear any conversation with others; understandable voice and speech patterns. Manual dexterity and coordination sufficient to operate office and/or classroom equipment. Sitting, standing and/or walking for extended periods of time. Use hands to handle and/or feel; reach with hands and arms. Must frequently lift, push, pull or carry up to ten (10) pounds and occasionally lift and/or move up to twenty five (25) pounds. 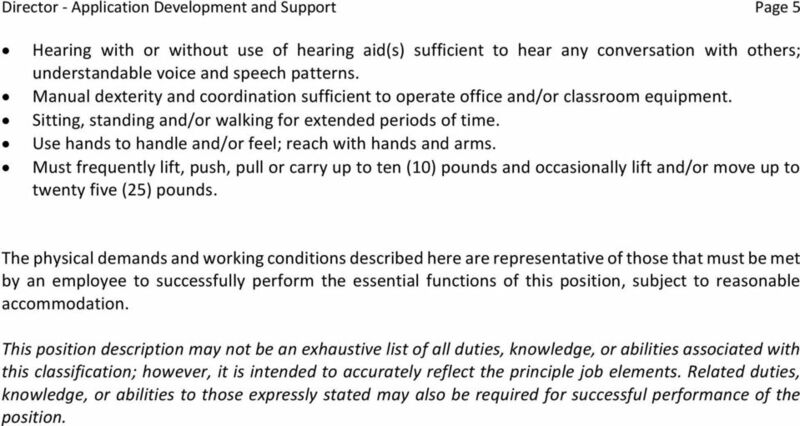 The physical demands and working conditions described here are representative of those that must be met by an employee to successfully perform the essential functions of this position, subject to reasonable accommodation. This position description may not be an exhaustive list of all duties, knowledge, or abilities associated with this classification; however, it is intended to accurately reflect the principle job elements. Related duties, knowledge, or abilities to those expressly stated may also be required for successful performance of the position.